Aside from the event's main quests, Party Time Quests appear at 12:00 and 20:00 UTC every day, and Surprise Quests appear at certain times of the day, shown hidden on the event map's background. (e.g. 22 indicates that a Surprise quest will show up at 22:00 (10pm) that day.) These are one-time quests that stay until the end of the event. and disappear once they are completed. Four additional copies can be purchased in the Event Shop with event currency: 10 , 50 , 100 , 500 needed in total. Purchase Craft Essences in the shop to increase the number of event item drops. One way is to do 40AP (which is the only Free Quest that drops Pumpkin Lanterns) until you have bought or collected the number of Maid in Halloween Craft Essences you want, then do 30AP if you are looking for a drop of Halloween Princess, and back to 40AP once you are done with that. 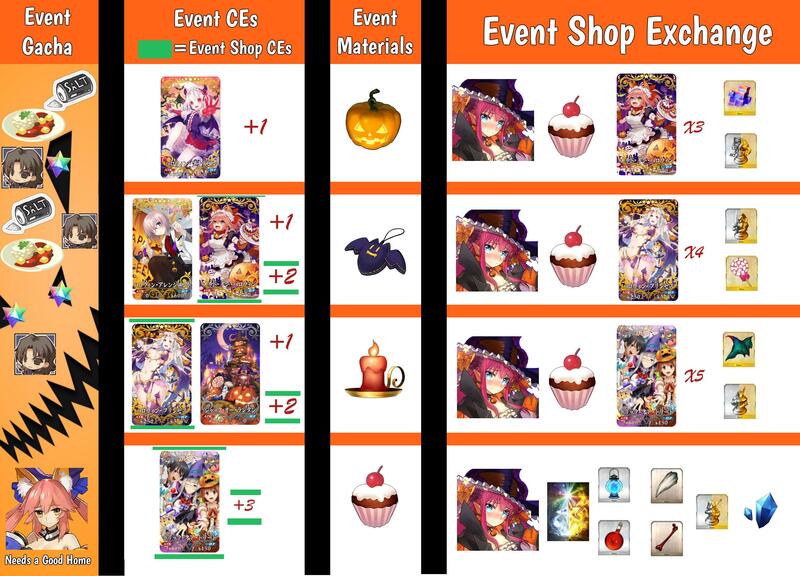 Halloween Princess is generally considered a good CE that can be used for a while. However, only four are available from the shop; the last copy for maximum limit breaking has to be obtained as a rare drop from 30AP (Event Free Quest) or one of the one-time quests. Trick or Treat (max. 5, 120 each) Not recommended; if you are in need of Petit Cakes to buy items in the shop, you can farm for higher-tier items and exchange them for Petit Cakes instead. Halloween Princess (max. 4, 100 each) Recommended - Do 30AP Event Free quests and Party Time Quests to get the last copy as a random drop. Maid in Halloween (max. 3, 20 each) Do 40AP Event Free quests and Surprise Quests to get the last two copies as random drops. Note: Given that you can exchange the higher-tier materials for a good amount of Petit Cakes, it is recommended to do the hardest (either 30AP if you are looking for a drop of Halloween Princess, or 40AP if you are not) Free quest you can handle. (80 Mischievous Bats needed for all four ascension items). 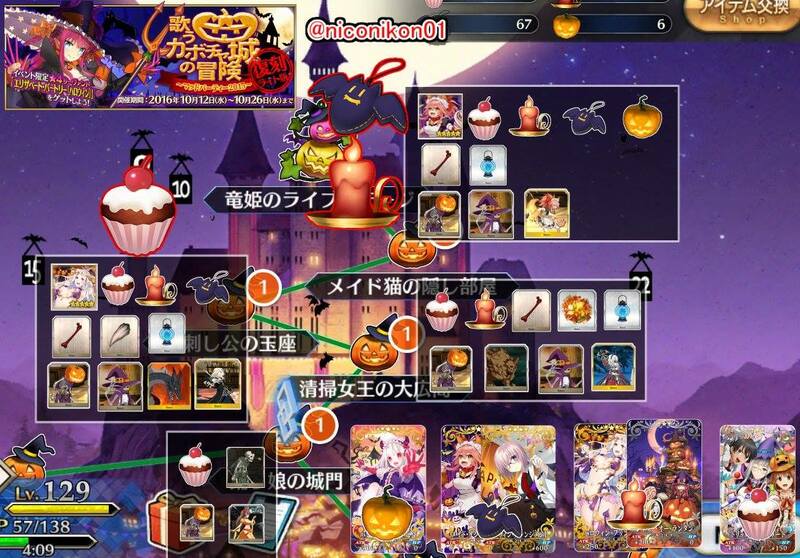 Pumpkin Lanterns, Mischievous Bats, Sweet Candles, and Petit Cakes can be exchanged for items in Da Vinci's Workshop. Items can be exchanged until November 11, 13:59 (JST). ; they increase event drops and help to make farming easier. is also a decent and usable Craft Essence. Only four can be purchased from the shop so if you are after a max. limit-broken Halloween Princess, the last one has to be obtained as a random drop from Party Quests or the 30AP Free Quest. - Cannot be farmed from quests, only available during certain events. - If you are lacking Petit Cakes, farm the higher currency (with the right CEs that increase drop for them) and exchange for Petit Cakes instead. Halloween Pickup Summons will be available for a limited time! In addition, "★5 (SSR) Tamamo-no-Mae" will be available for the first time before her official appearance in Chapter 4. Once the Pickup Period has ended, Tamamo-no-mae will reappear as a Story Summon. However, she will only be available after the fourth Singularity opens. In addition, by equipping limited-time Craft Essences "★5 (SSR) Little Halloween Devil", "★4 (SR) Halloween Arrangement" and "★3 (R) Jack-o'-lantern", you can acquire more event items during the event. "★3 (R) Jack-o'-lantern" will also be available from Friend Point Summon for the duration of the Halloween Pickup Summon. Surprise quests were called Guerrilla quests in the JP event. The times stated below are the Party and Guerrilla quest times in the JP run of the event. This page was last modified on 18 October 2018, at 04:56.